From the first moment Francis J. Underwood (Kevin Spacey) is on the screen, we sense that he is a dangerous man. It’s not when he coldly smothers a dying dog or the low angle the camera is at when he does it, but rather it’s as he breaks the fourth wall and lectures viewers on the types of pain. He is cold and factual. In the next scene he introduces us to the main players of “House of Cards,” with a distance and boredom that confirm his knowledge of the political landscape. Instead of coming off as a player vying for power, he is a harmless watcher biding his time. That is until he is denied the Secretary of State position he was promised by the present administration, one Frank helped put in power. This broken promise instigates a series of events that are motivated by revenge and hidden ambition. 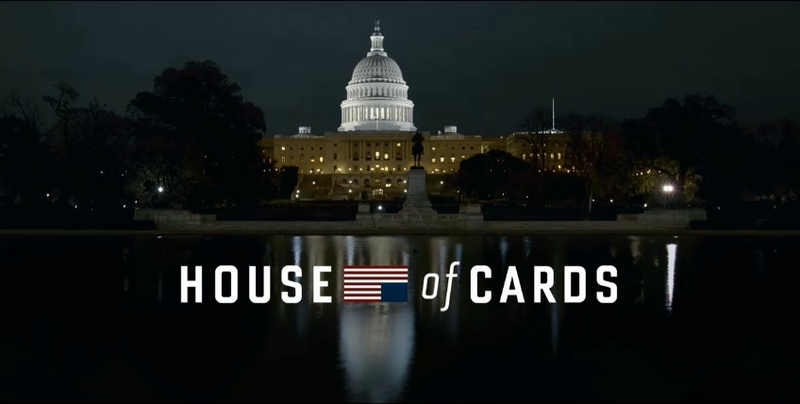 House of Cards is Netflix’s second foray into television. The first was Steven Van Zandt’s little seen gangster comedy Lilyhammer. It’s soon to be followed by the rebirth of “Arrested Development” in May and Eli Roth’s horror series “Hemlock Grove,” which debuted this week. The entirety of the series was released on February 1st this year, and it’s perfect for lazy weekend binge watching, instead of waiting weekly like a regular human being. It might be a tad bit over dramatic because, as corrupt as Washington seems, I refuse to believe it’s as bad as the show portrays it. Foreign policy is barely mentioned and with all the power bargaining, I’m surprised no other world powers have invaded the U.S in this show. When compared to other political series like “Homeland” and “Scandal” this is surprisingly tame, albeit with a much greater degree of realism. That “House of Cards” is based on a BBC show of the same name from the ‘90s, also on Netflix, which in turn was based on the novel by Former Deputy Chairman of the Conservative party, confers more legitimacy on it than the others. Coupled with Fincher’s post-Seven style, menacing in lights, tone, and shadows, it gives it a certain degree of realism. One could easily tell Netflix pulled out the big guns as soon as Kevin Spacey graced the promotional posters. The last time I remember Kevin Spacey being on a TV show was “Wiseguy” and that was the ‘80s. Spacey delivers as the South Carolina Congressman and House Majority Whip, a scheming and equally charming backstabber, who as he’s done betraying you will either let you know you’ve been defeated or further deceive you into believing he’s done you a favor. In an age where villains on reality shows are championed as modern anti-heroes, it’s refreshing to see someone getting it right. 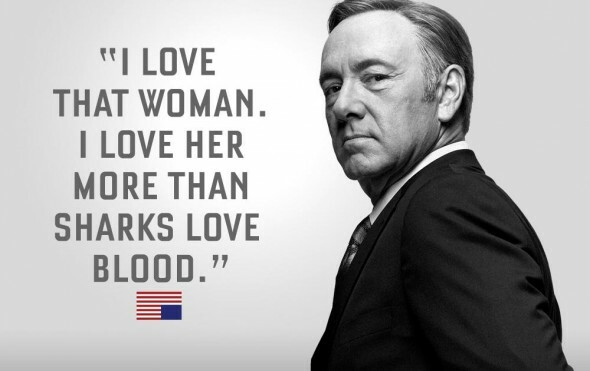 Spacey’s Francis Underwood is only over the top in his actions. Keep in mind this is the kind of villainous character that begs for overacting. But in Spacey’s case it’s most noticeable in the use of his strong Southern accent. A lesser actor would Foghorn Leghorn or Willie Stark the role, but in Spacey’s capable hands he easily skips that hurdle with a glaze of the accent in Washington, only going full Southern man when around friends or agitated. Frank Underwood needs to have everything his way and does not believe in compromise, which is a little ironic since he works in Washington. If he can’t have things his way, he is willing to destroy anything in his path. He understands people at a molecular level and can manipulate anyone, even righteous people, using their piety to his advantage. With his Luciferian qualities he has a team of people ready to do his bidding. His wife, Claire Underwood (Robin Wright) is similar to Lady Macbeth, but comparisons end where Lady Macbeth’s guilt leads to her suicide. Claire lacks any sense of guilt and understands her husband’s drive. Claire and Frank are partners through and through, sharing plans and formulating new ones. Ironically, Claire is the head of a Non-Profit organization, The Clean Water Initiative, which of course has its own set of issues under her leadership. There’s also Frank’s Chief of Staff, Doug Stamper, Frank’s right hand man and fixer, making sure his boss’s orders are met; from bribing public officials and prostitutes to threatening sexually deviant restaurant managers. Doug does it all with a professional and scarily confident demeanor. He is one of the few people aside from Frank’s wife that truly has his ear. Zoe Barnes is probably my least favorite character on the show because, like Frank, she is willing to do whatever she has to do in order to get where she wants to be. She starts out as a small time reporter for The Washington Herald, but after getting fed inside information from Frank, she rises through the ranks of political reporting till she leaves the Herald and works for the more youth oriented website Slugline. Zoe knows Frank is using her as a puppet, but needs his intel in order to move up in the world of political journalism. Frank sees himself in her and their relationship silently builds from patronizing to symbiotic and finally a mixture of mutual respect and fear. Then there is Peter Russo (Corey Stoll), the congressman from Philadelphia, a good man with bad habits; habits like cocaine, alcohol and prostitutes. Basically, he is every political scandal you’ve ever heard of rolled into one man. Instead of seeing him as a completely tragic figure, he is given a shot at redemption by Frank, which he tries but ultimately squanders. One of the only human relationships in the show is Peter’s workplace relationship with Christina Gallagher (Kristen Connolly) his secretary. His story hits all the normal notes in a tragedy; gives us hope for the character, then dashes it away ending with his humiliation and fall. Corey Stoll plays Peter as not only a victim of Frank’s, but someone that completely falls for his manipulation. He’s an example of the many pawns Frank uses and tosses to the side when they have outlived their usefulness. The way the show portrays politics is scarier than other shows with a political slant, like “The Thick of It” and “Veep,” which share the same creator/writer Armando Iannucci- which use comedy to display the miscommunication and anarchy that is modern politics. “House of Cards” uses Frank’s drive for revenge to highlight the corrupt nature of present-day politics and the issues at stake at extremely high levels of power. There is no room for emotion. And idealism is used as cheap P.R to manipulate the public. Another thing the show does that I enjoy, is Frank’s back story: he doesn’t have the tired story of a plucky idealist armed with his ideas thinking he could change Washington, only to have it change him. Frank is always seen as a petty megalomaniac perfectly fitting in on Capital Hill, he didn’t need to change for Washington, he was meant for it. The plucky idealist of the show is Gillian Cole (Sandrine Holt) who is recruited by Claire’s non-profit in hopes of rejuvenating it. As she begins to realize how things are done in Washington, chiefly learning about the tricky beast that is compromise, thanks to Remy Danton (Mahershala Ali) a powerful natural gas lobbyist, she begins to rethink her position in the company and butts heads with Claire. Claire sees nothing wrong with the compromises she makes with Remy; it’s just the modus oprerandi of modern politics. This is one of the many ways the show reflects on real world issues. There is the grim realization of the way things are done versus the way they should be done. Youthful idealism clashes with real world politics, which brings to mind the failure of 2011’s Occupy Wall Street movement. When Gillian is compared to the ambitious Zoe, Gillian seems out of her element and naïve. Zoe flourishes in the world of politics because she understands its language and uses everything at her disposal as a tool, from sexuality to gender to blackmail. While Gillian is left with anger and why things are the way they are. It’s painful seeing Zoe use these “tools” to move ahead. Similar to love and war, there are no rules in politics. Zoe moves faster than she should in the journalistic world with little or no consequences, which is something that bothered me initially because she represents the ambitious youth that yearns to move up. But at what price? Remy Danton is the only person who doesn’t seem to get his hands dirty in Washington. As a lobbyist for SandCorp, a natural gas company, he holds the money, and has no concrete alliances to anyone including SandCorp. A former protégé of Frank, who chose money from lobbying over the power of politics, he stands above the fray, placing bets on whoever he needs to win, as long as his client comes out ahead. A great scene that captures Remy’s personality perfectly is when he’s asked why he doesn’t eat pork after he refused an offer to dine from Frank. Remy responds that he stopped after he lobbied for the Pork Industry. Initially, one might think it’s because he’s a Muslim, Remy is an African American man, but no, it’s only after he’s aided the sketchy Pork Industry, he stops eating pork. The show might shine a light on the corrupt nature of politics, and the demands one faces when entering such a world, but at its heart, it’s a story about Francis J. Underwood’s vengeance, and Spacey delivers. This will be far from a defining role for Kevin Spacey, but it comes close, especially to a new generation of viewers who know him as that bald guy from that one terrible Superman movie. House of Cards is a bold first step for Netflix in the television department and fits right up there with any political drama. This season ends not with a cliff hanger or a shock, but rather with my growing anticipation for the second season. Tagged Arrested Development, Christina Gallagher Kristen Connolly, Corey Stoll, Doug Stamper, Kevin Spacey, Lady Macbeth, politics, Pork Industry, seen, youth, Zoe Barnes. Bookmark the permalink.